The place where you work needs to have a creative and well-appointed appeal. Home offices and small business spaces deserve their own decorative flair. World Buyers’ selection of home office accessories and décor will give your customers the ability to take their home office décor to new heights. You’ll find desk accessories, journaling supplies and other home office decorations. Shop all of your wholesale home office needs with World Buyers today! Antiqued gold metal pineapple tray. Perfect for holding jewelry and trinkets. Cactus pens with blooming Saguaro and Blooming Prickly Pear styles. Each pen is attached to a hang card with fun facts on the back for each. Available only at WB. FYI: Saguaro [suh-gwahr-oh] Click on alternate images to read the back card fun facts! Cute little mushroom patch paperweight. Hamsa incense holder. Can also be a paperweight or a wall plaque! Blue with green, yellow and shades of red. 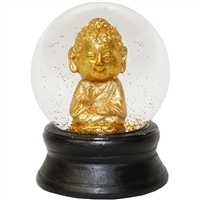 Cute little gray Buddha bank. Poly-resin. Coconut shell display with 100 little nodding spiders. Clearance price shown nearly 80% off! Lovely mermaids with vintage and WB original designs. Assortment of 6 designs. 12 Journals each with black string tie. Whimsical unicorns flying in a magical sky! 3 designs with same images on front and back. 12 Journals with black string tie. Cactus and succulents journals with beautiful vintage and WB original art! Design is the same on front and back. 6 designs. 12 journals with Black String tie. Large blue leather journal with embossed gold paisley design on front and back. Hand bound with natural pressed paper inside. Small brass bell beads bound to journal's spine. Clearance price shown now 50% off. Modern psychedelic skull with colorful detail. 4 different color palettes. Clearance price shown nearly 50% off! 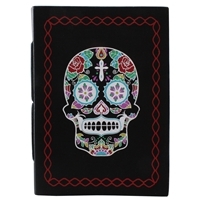 Unique alternative style journal with skeleton artwork on the cover. "Old world" natural paper pages. Black leather journal with natural paper. Red sugar skull on the cover. Black leather journal with natural paper. Sugar skull on the cover. Clearance price shown now 50% off! White leather journal with natural paper. Sugar skull on the cover. Clearance price shown now 50% off! Lovely Mermaid Thalassa is glistening with irridescence and has her tail wrapped around golden coral. She is named after a sprit of the sea goddess and is part of Atargatis' pod. Read about Atargatis and the origins of Mermaids on the back of the hang card - a World Buyers original story! Each pen is hand painted. Lovely Mermaid Salacia is glistening with irridescence and has her tail wrapped around aqua coral. She is named after a sea goddess and is part of Atargatis' pod. Read about Atargatis and the origins of Mermaids on the back of the hang card - a World Buyers original story! Each pen is hand painted. Pampered cats on colorful cabochon key rings. Each side has different face. Assorted dozen. Exclusive World Buyers Happy Buddha artwork on cabochon key rings. Buddha with: Lotus & lily pad, Bodhi tree & butterfly, and Sakura Blossom designs. Fantasy sky with flying unicorn key rings. Assorted dozen. Festival elephant on parade. Three designs. Rainbow unicorn mini snow globe. Pastel rainbow Glitter. Black base.